Human usually brushes their teeth for their health. Dogs are too, they need to clean his teeth to his health. However, how to properly clean your dog teeth? There are several home remedies that can clean your dog’s teeth properly. With these ways, your dog’s smell will better than do nothing (not do cleansing teeth). 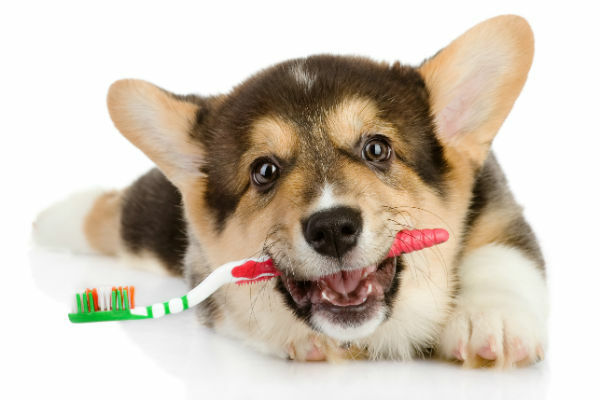 Let’s check out below here how to properly clean your dog teeth with several home remedies. Your dog breath is worse, so your dog needs to brush his teeth. Before you clean his teeth, please purchase dog toothbrush and his toothpaste too. Why you should purchase a dog toothbrush? It designed for a dog, the toothbrush has softer bristles and it will give you easy access to reach those hard areas while clean his teeth. Do not ever to use a human brush to clean your lovely dog’s teeth. However, if it is necessary you can use soft’s child brushes to clean his teeth. Unless for other option you can use specially designed pads and sponges if your dog not much like the brush. Then, pick the right time. When your dog is calm, it is the right time for brushing time. Call your dog then make he allows you to the bathroom. Closed the door gently and lock it. Before the brushing time, make a comfortable atmosphere here. You can play with him or treat him with his favorite. While your dog is in your hand, let’s brushing time now. Before checking his gum and teeth, please do this. Massage his lips with your finger in a circular motion for 30 to 60 seconds. This is important if your dog has an adverse reaction while you touch its mouth. Then, touch his gum and teeth without a brush. Lift and hold his upper lips with your finger then rub it gently. You have to train him at least one to two weeks until you can check his gum and teeth without a brush. After that, place some toothpaste in your finger. Let him see, know, smell and lick that toothpaste. He will know how its texture and the taste. He will love it. After introducing the toothpaste, please do it the same with the brush too. Touch his teeth with the brush. Touch his both top and bottom with a brush for 30 to 60 seconds. Yes, you have to train your dog first. If he can do this give him rewards for his good behavior. Okay, it is the time for the brush. First, give some toothpaste for him. Let him licks that, if he feels okay with that then you can start to brush. As usual, put some toothpaste on the brush. Hold the upper lips at 45 degrees and place the toothbrush to its upper lips. Brush it in a circular motion gently and focused to remove tartar and plaque. If it is finished, you can move to brush to the inside of the teeth. Usually, while you brush him inside of the teeth your dog might resist. Do not fight with your dog. Let’s end this with rinse it gently with fresh water and dried it with the cloth. 6. How often to brush his teeth? The big question, how often to brush his teeth? Every day, you can do it once a day to brush his teeth. But, if you cannot do every day you can do it five times a week. At least, you can do it three times a week. Yup, this thing is really important to kill the bad breath in your dog. If you do not want his breath worse, just do this brushy. It smell will good and also make his gum and teeth healthy as always. What are the natural dental sprays? Well, it is another option to make your dog’s breath becomes good. You can spray his teeth and rub it with your finger after done cleaning teeth or while you cannot do the brushing. This natural dental sprays really designed only for dogs. It can help to whiten teeth, freshen breath, reverse gingivitis, remove plaques and tartar buildup, and also maintain healthy gum and teeth. There are many variations of this sprays. Go and get in at your near pet shop. However, if you feel that toothpaste for a dog is expensive, you can try to make DIY toothpaste for your dog, how? You can make it with coconut and stevia. Here how to make, first gathering the ingredients; 4 crushed stevia leaves, some organic coconut oils, 2 tablespoon of baking soda, and 15 drops of edible aromatic oils. Make this toothpaste is very easy. Just mixe it all, the stevia, baking soda in a small bowl. Last, drop few of edible aromatic oils that suit with dogs. With this, plaque, tartar, and bad breath will be eliminated with stevia. Your dog teeth will clean and also health. The second recipe that easiest DIY toothpaste to make is baking soda and water. It is very based toothpaste, with this based ingredients you can make another DIY toothpaste recipe like above points or like toothpaste with chicken broth and aromatic herbs. This based DIY toothpaste, baking soda, and water you can make it this toothpaste while you want to brush his teeth. Drops some edible aromatic oils or some crushed mint or cinnamon in this toothpaste. Your dog will love this. Baking soda will eliminate your dog bad breath just in a minute. Finally on how to properly clean your dog’s teeth; how often we should see the veterinarian? If you see any symptoms that are shown in your dog, so you immediately must see veterinarian quickly. These are lists of some symptoms that may get in your dog; incredibly bad breath, excessive drooling, anxiety, sleeplessness, there is a change in eating habits, bleeding or swollen gums and also visible ulcers in the mouth area.